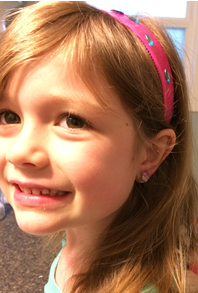 My daughter came home from school the other day and announced that “a whole bunch of kids in my class are getting their ears pierced”. She then lamented that, although she, too wanted to get hers pierced, she wasn’t quite comfortable with the method around it (in her own words, she didn’t want to get poked with a needle). I had a major lightbulb moment as I realized something new and wonderful that I had been given to try from my Editor – a new and innovative product called EARZINGS!!! Founded by mom and entrepreneur Laura Pfaff, EarZings are super cool, pierce free earrings with a patented spring design that allows you to wear cute earrings without the use of holes, clunky clips or magnets! It's unique coil design construction applies gradual tension to gently, but firmly, affix the earring to the earlobe. I was skeptical at first as I thought they wouldn’t stay on very well, but I sent my daughter off to school and told her that if they became uncomfortable or bothersome, to take them off and put them in her backpack. To my surprise and delight, when she got home at 3:00 the EarZings were still on her ears! Overall, it is a super cute product that works very well. They also sell box sets complete with a pair of earrings and a necklace, as well as dangly attachments that can add some bling to the earrings. My daughter has two super cute pairs – a puppy dog and cupcakes – and we will definitely be purchasing more! EarZings are hypoallergenic and made in the USA. They are also free of lead, cadmium, nickel and all other heavy metals. You can buy the EarZings at www.earzings.com or shop at various retailers around the USA and Canada www.earzings.com/retailers/ for more information. Melissa Collins is a freelance writing mother of two girls. When she’s not cleaning up cheerios and play dough, she can likely be found curled up n her hammock with a good book. Check her out at www.mellysmommymanual.com.